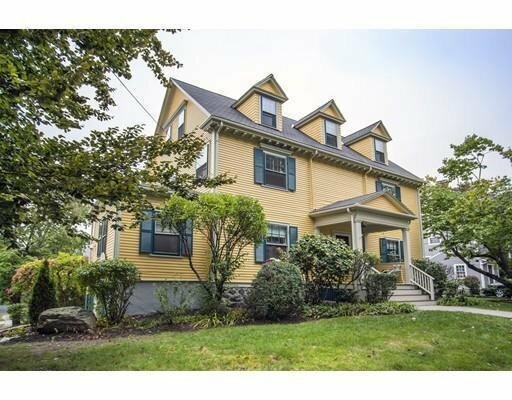 Situated on a corner lot, just 2 blocks from town center and train, this stately 1897 Victorian boasts numerous updates inside and out and is full of original charm. Grand foyer entrance w/ impressive staircase leads to an elegant floor-through parlor w/ pocket-doors, multiple seating areas, fireplace + built-ins. A modern craftsman-style chef’s kitchen features an eat-in breakfast nook, hardwood ceiling + floor, granite + stainless steel, Gaggenou oven with rotisserie and dishwasher, Thermador cook top with griddle, unique custom Amish-made cabinetry. Butlers pantry to handsome formal dining room w/ original detail, wood beams, pocket doors + fireplace. Excellent bedroom sizes + ceiling height throughout. Tastefully tiled baths are updated/ pristine. Master BR offers en-suite bath + fireplace detail. Flexible top floor ideal for home office + media room. Oversized driveway w/ new retaining walls. Newer roof + heating systems. Brick Patio. 1 car garage. Come home for the holidays!